We have a great range of doggy themed accessories to brighten up your home. From doggy door stops to dog lead hooks you are sure to find the perfect home accessory here. 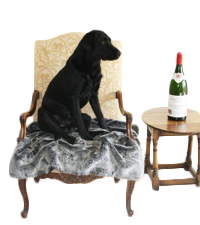 We have luxury dog throws for your furniture and why not add a new cushion or two to make a welcoming change. Never forget your dog's appointment at the vets with one of our luxury dog memo boards covered in a selection of doggy fabrics that will look fantastic in your home. We have a wonderful collection of home accessories that will look great in any home. Most of our home accessories have a doggy theme but you’ll also find some beautiful things that will make perfect gifts for family or friends, dog lovers or not. Browse our range of sofa throws, memo boards, cushions, lavender hearts, dog toy bags, dog lead hooks, dog shaped door stops and draught excluders.